It seems like Hurricane Harvey was here, raining on us, for at least a month. But, in reality, it was only a week ago today (Wednesday 8/30/2017), when I learned he was headed our way, and I needed to prepare. You need to understand that when we first learned about Harvey, he was just a Tropical Storm, and we’ve been through lots of those around here. People don’t take them as seriously as hurricanes. But Harvey was different. He started strengthening so fast, everyone paid attention. The National Weather Service and the local media meteorologists were warning that this storm wasn’t going to be like a normal hurricane. It was going to stall out over us and just sit there for a while because of the surrounding highs that were preventing it from moving. Before hearing about Harvey, I had planned my week very carefully, with lots of time to work on my book and my other goals. In the past when I needed to prepare for a storm, I’d bought a little water and my regular groceries, but not much else. But, this time I think God was warning me. I had an intense feeling that this was going to be different and I needed to be ready. I dropped all my plans and stocked up on water, food, medicine, dog food, batteries, and gasoline. I filled every container I could find with water, in case the power went off and the water well quit working. I cleared the stuff that could become missiles in the wind out of the yard. Everyone else must have felt the same urgency because the stores and gas stations were packed. They quickly ran out of water, batteries, and gasoline. The stores were trucking in additional supplies as fast as they could from other locations. They had to ration water, so there was enough for everyone, and every night on the news we would see pictures of empty store shelves. Some of the counties along the coast where Harvey was supposed to make landfall started ordering mandatory evacuations. If people refused to evacuate, they were told to write their social security number on their arm with a Sharpie so their body could be identified. My neighborhood is southwest of Houston about forty minutes along the Brazos River. We weren’t too worried about the storm itself because it was making landfall south of us at Rockport, but the meteorologists kept saying it was a rain maker. 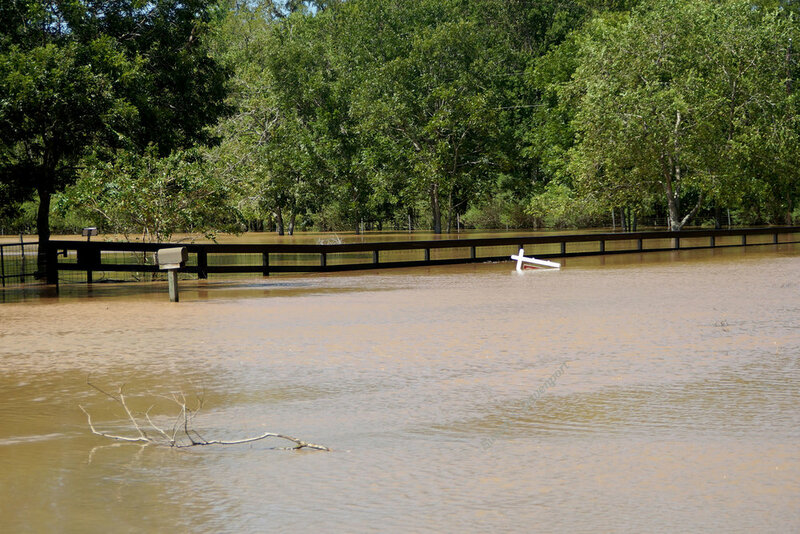 Too much rain can be dangerous when you live as close to the Brazos River as we do. On Friday evening Harvey tore into the small town of Rockport as a category 4 hurricane. Texas has not experienced a hurricane that strong since Carla hit on Sept. 10th, 1961. I still haven’t heard how much damage was done in Rockport and surrounding towns, but the pictures I’ve seen look catastrophic. We weren’t in Harvey’s direct path, at least not then, but he was already raining on us. We got over 20” of rain in the first two days. Then Harvey started heading back out over the Gulf and toward us. By this time, he was a Tropical Storm again, so the winds weren’t as high, but that didn’t matter because the rain kept pouring down. Harvey was moving so slowly, 1-2 MPH, it was taking forever for him to get here. I thought I would be able to accomplish so much while I couldn’t leave the house, but instead, I found myself glued to the TV, listening to the rain as it pounded the roof. The intense rain had started flooding Houston, and the pictures were so incredible that I found it difficult to believe even though I knew it was real. I kept telling myself I needed to get up and work on my book, but my mind wouldn’t focus on anything other than the rain, the latest update on the storm’s location, praying for the power to stay on, the incredible stories coming out of Houston, and my family. My brother and sister also live in the Houston area. We regularly texted to make sure everyone was ok. We’d watch the weather and then warn each other if a tornado was coming. I set my phone to alert me when a tornado warning was issued for my area, and it went off so many times the first couple of nights, I didn’t get any sleep. I live in the most wonderful neighborhood. We are all connected via Facebook and the Internet. As the storm got worse, neighbors started checking on each other. Those of us with higher houses volunteered spare bedrooms to those who were in jeopardy. Stock was moved from pastures that might flood to a neighbor’s pasture on higher ground. By Sunday the county judge ordered a mandatory evacuation of low lying lots in our subdivision because the Brazos was rising and was supposed to break high-level records. But by then there were very few safe ways out. The highways were either flooded or collapsing due to high water. So, instead of evacuating, everyone stayed in their homes or moved in with a neighbor. Harvey’s visit was a historical event. Houston received over 9 trillion gallons of rain, and the National Weather Service had to add a color to their color coding system to reflect the extreme amount. I’ve been told we received 48” of rain in our neighborhood. Because we are out in the country where the homes are farther apart, and the water is not restricted with levees, the flooding here was not as dramatic as Houston’s flooding, but it was bad enough. Many of my neighbors have water in their yards, and some have water in their homes, but fortunately, everyone is ok, at least physically. I have had my home flooded out before. I was hauled through chest deep water with mounds of fire ants and debris floating around me in the current. I was fine physically, but I will remember that night for the rest of my life, and you won’t ever catch me buying a home right next to the water. Some of my neighbors are experiencing the same feelings. This is our third major flood in the last three years. The new subdivisions and levees farther up the river are negatively impacting the Brazos and the frequency of major floods. Some of my neighbors are tired of the repeated flooding and want to get out. But it’s hard to sell land that floods, even if the water never gets into the house. And then there are the animals. They’ve been dramatically impacted too. Most of the time my back yard is full of bird song, but the birds were silent during Harvey. I was at least dry and safe, but the animals had to hunker down in the midst of the storm. Hurricane Harvey was truly horrible for many people, but it was also wonderful because of the way people helped each other. It didn’t matter whether they were a Trump or Clinton supporter. Color, religion, gender preference – none of it mattered – everyone helped each other. This tragedy brought out the best in people, and that was amazing to see. We are fine. We didn’t get water in our home or lose power. I feel truly blessed. But there are a lot of people who weren’t that lucky. Many thousands of homes have been destroyed across the state. As I sit here typing, with the sun shining outside, they are still doing high water rescues in Port Arthur and Beaumont. So many people have been displaced and lost almost everything. It is hard to imagine Harvey’s true impact, or how long it will take to recover. We have a saying in Texas, “Texans take care of Texans.” That’s true, but it doesn’t tell the whole story this time. Volunteers have come from all over the country to help, bringing their personal boats and working long hours to save strangers. The Coast Guard, the Navy, and the Marines joined in the rescue efforts. This has truly been a story of “Americans taking care of Americans,” and I am so proud of every one of them. Yes, Harvey has made a devastating impact on Texas, but it has also given us the opportunity to see just how wonderful people can be, and that has been remarkable. If you have been affected by Harvey, whether as a victim or a first responder, my prayers are with you. Be safe.